Alexa refuses to say "hippopotamus" in Spanish. Amazon's speaker-dwelling voice assistant knows the translation, but you have to open the Alexa app on your phone to see it. It's the kind of clunky workaround the Echo Show, Amazon's new touchscreen version of the popular Echo smart speaker, seems built to address. Instead, its glossy 7-inch screen displays a message telling you to ... do more work, like open the app. The Echo Show ($230), which starts shipping Monday, is the first major evolution for Amazon's category-creating speaker. Adding a screen is a logical move for the voice-controlled line. Unfortunately, the Echo Show is not nearly as useful as it should be. It doesn't show maps or webpages and it's missing obvious features like the ability to share photos you take. Echo speakers use always-listening microphones to detect the wake word, "Alexa." Users then speak their commands. They're helpful for catching up on news, setting timers, adding bananas to shopping lists, and controlling smart home gadgets. However, there are other times when a visual assist would be beneficial, such as looking at recipes, checking lists, or seeing if your Lyft is nearby. The Echo Show adds simple visual components for most of its popular requests, as well as some (very) bare-bones tablet functionality, like a photo booth tool. 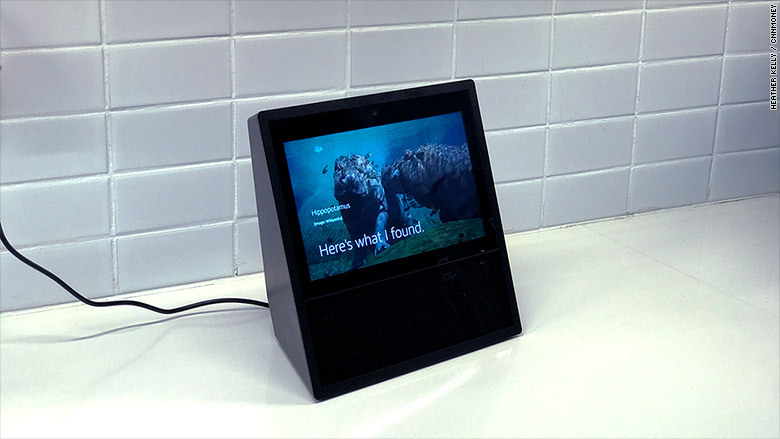 In addition to its usual Alexa powers, the Echo Show is a phone, TV, karaoke machine, and digital photo frame. The screen stays on even when you're not using it. Pithy headlines like "Lil Wayne Sells Big House" cycle though on a rotating background of photos. Say "Alexa, what is a hippo?" and it displays a photo of hippos while it reads the definition. Ask for videos of hippos and it jumps to YouTube. Tell it to play "I Want a Hippopotamus for Christmas" and it scrolls through the lyrics so you can sing along. Other third-party "skills" -- the Echo's version of apps -- already work with the Show, but they'll be updated to take advantage of the screen in the coming weeks and months. You can make video calls to people who have an Echo Show or the Alexa app. During my testing, the video was frequently pixelated and the audio sounded like the other person was trapped in a large box. Sometimescalls wouldn't go through at all. Alexa features are limited while you're on a call, so you can't multitask by dimming the lights or checking the weather. The Drop In feature, which lets approved contacts open a video connection with your Echo at will, is an interesting idea. Someone could use this to check in on their home or dog, like a Wi-Fi security camera. If Amazon wants to fill our homes with Echos, it will need to make them work together. Only one device plays audio at a time, so don't expect surround sound Rihanna or NPR. If you have multiple Echos, the device closest to you will process your request. If you have an alarm going off on one but are closer to the other, yelling "Alexa, Stop!" repeatedly in a rage will not turn it off. The Show comes in black or white, but the design is uninspired and dated. Its angle is not adjustable and the device is too large to mount on a refrigerator or wall, which is a missed opportunity. Released in 2015, the Echo set off a race among the major tech companies to build their own voice-activated smart speakers. Google followed a year later with its Home speaker. In early June, Apple announced the $349 HomePod smart speaker, which launches in December. Alexa was never the smartest virtual assistant. Google Assistant, Siri and Microsoft's Cortana all had more experience. But Amazon did something unique: It designed the Echo operating system to be entirely voice-first and that made the Echo instantly more useful. It also opened up its platform to developers. Alexa now has more than 13,000 skills. Updates to those skills could greatly expand the Show's usefulness. There are already a few news apps from Bloomberg, CNBC and CNN that show top headlines with images and videos. AllRecipes is a natural fit if you keep the Show in your kitchen. Is a fully-functional Echo with a screen -- shortcomings and all -- better than an Echo with no screen at all? For anyone considering buying their first, it's only $50 more than classic Echo. Most of the Show's issues could be addressed with software updates. 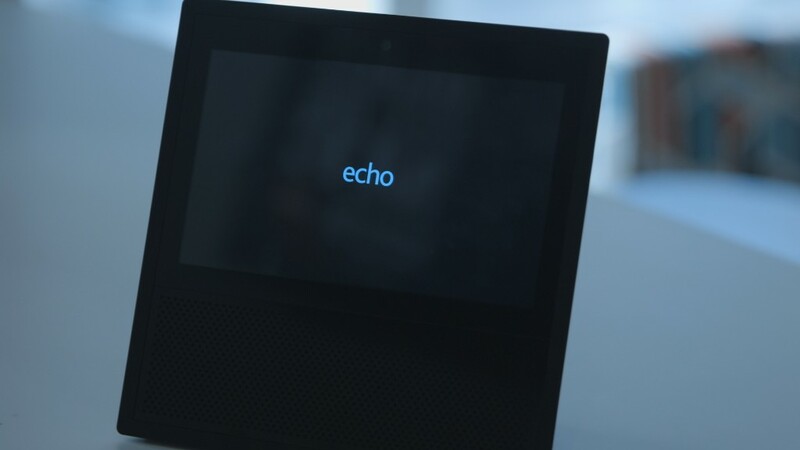 Like the original Echo, it will likely need some time to find its groove. Amazon will hopefully take a break from trying to make oddball new hardware, like its outfit-judging Echo Look camera, to focus on improving the Echo experience. And if you're still wondering, it's hipopótamo.